Eureka’s Dualis sleeping pad puts an end to needing one lightweight sleeping pad for backpacking, and one inflatable air tube mattress for car camping. 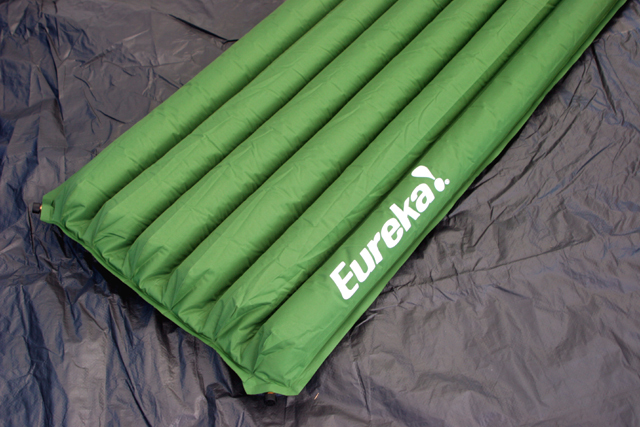 Eureka was clever enough to add air tube chambers on the top of the pad to provide air mattress-like comfort, then add an open cell PU foam pad underneath, for additional support and thermal resistance. Compared to a standard self-inflating foam pad the Eureka Dualis is by far more comfortable. 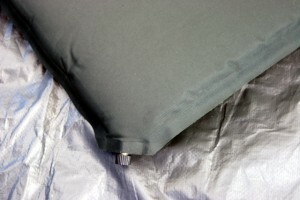 The top (air tube side) is soft, yet doesn’t allow your sleeping bag to slip off easily. 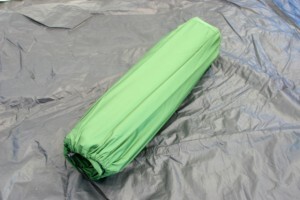 The bottom is a textured non-slip rip-stop nylon that keeps the pad secure to the bottom of your tent or bivy. Inflating the pad takes a little longer than a standard self-inflating pad, but that’s because there’s more to it. The Eureka Dualis has two valves. One inflates the bottom foam chamber (self-inflating) while the other valve requires you to blow-up the air tubes. It’s a slow process and at high altitudes it can leave you dizzy. But it took us only a few minutes to get it fully inflated. We liked the fact that both valves seemed very durable as they are made of metal and feature a hard plastic cap. The Eureka Dualis deflates quickly, rolls up to about 3-4 inches in diameter, and comes in its own storage bag with draw string and lock. Eureka also includes two wide, soft elastic bands to hold the rolled up pad in position. It also comes with an extra patch so you can make repairs while on the trail, and still sleep in comfort. The Eureka Dualis stores in its own sack and measures around 4-inches in diameter. You can easily lash the pad to the bottom or sides of your pack. The pad comes in two sizes, the Dualis ST Regular has 1.2 inches (3 cm) of foam and when inflated is about four-inches thick. With the added air tubes also serving as insulation, the Dualis ST Regular has a great insulating value (R-value) of 3.7. This makes it a great four-season pad that we tested in the snow and stayed warm all night long. The Dualis ST Regular weighs in at 2 lbs. 14 oz and measures 72×20-inches. It’s definitely not for ultra-light backpackers, but to it’s credit, it’s not any heavier than most standard self-inflating pads. So if you want extra comfort, this is the way to go. The Dualis is also available in an ST Large that has 4.8-inches of thickness when fully inflated and includes two-inches of foam padding. It has an R-value of 5.2 making it even better for cold conditions and especially comfy if you’re an avid car camper looking to save some weight and space over an air mattress. The larger model weighs in at 4 lbs., 4 oz and measures 78 x25-inches. The top air chamber and self-inflating pad chamber each has a valve. 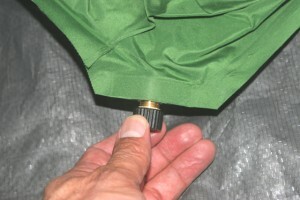 It takes about three to four minutes to inflate the top air chambers. In the meantime the bottom chamber self inflates. The bottom of the Dualis is a non-skid, rip-stop nylon that works well to keep the pad from slipping in your tent or bivy. With the foam and air chambers, the Dualis has great insulating capabilities making it an excellent four-season sleeping pad.